We've just had Jacob Golden perform an acoustic set in our living room! How amazing?! My husband and I decided to make a bit of a party out of it and invited as many friends over as we could muster at short notice. On Friday I re-arranged the living room a couple of times (Is your lounge always set up for a concert?) and I did sort of wonder what I had let myself in for - after all, it’s not every day that you have a recording artist play in your house. The fear of the unknown made me feel apprehensive but I also wondered how Jacob Golden must be feeling, after all he was the one with more reason to be nervous playing in an intimate surrounding to an audience of complete strangers. 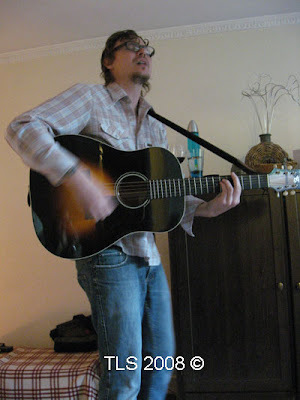 For those of you who haven’t yet heard of Jacob Golden: he is a singer/songwriter living in Portland, Oregon, USA. Earlier this year, Jacob made an appearance on the Later with Jools Holland show alongside Sheryl Crow, Liza Minelli and Hot Chip. 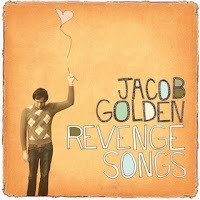 Jacob’s music has been described as “like Simon & Garfunkel without Garfunkel, but not just Simon on his own.” His latest album, Revenge Songs, is a collection of songs not afraid to explore head on those deep down parts of your soul many try to hide. Holding 11 tracks of pure, raw emotion it was recorded in whatever space he could find –his bedroom, kitchen, hallway, underground car parks and concrete art galleries. Consequently a lot of background noise has been left in the finished record, - on ‘Zero Integrity’ you can even hear an ambulance siren in the background. I fell in love with this album the first time I heard it. As Saturday afternoon arrived, our little garden buzzed with excitement awaiting the arrival of our very special guest. In spite of a very big local rugby game and a protest against the expansion of Heathrow airport, Jacob and his charming girlfriend Sarah found their way here without a problem. While Jacob warmed up in a room in our flat (embarrassingly the room where I’d thrown a lot of our excess junk to make space in the living room i.e. our bedroom! 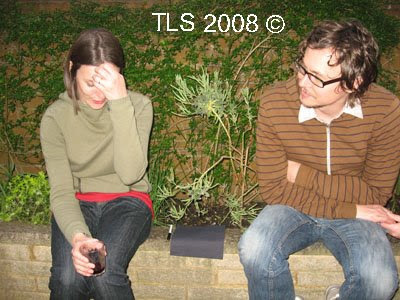 ), Sarah had a chat with ourselves and our friends. Both were very much at ease and within half an hour or so, everyone congregated in our living room and so the performance began. Jacob began his set with his latest single from Revenge Songs, ‘On A Saturday’. He went on to play several songs amongst which were my favourites: 'Out Come The Wolves', 'Pretend' and 'Hold Your Hair Back'. The stunned, impressed looks on my friends faces during the performance reflected exactly how I felt. This guy is the real thing and he’s creating this amazing thing in our living room - how special is that?! The entire performance was well pitched and it was lovely to have a singer put so much of himself into impressing what was after all a rather small audience. When the set was over we got the chance to sip a beer and chat with him in our garden. 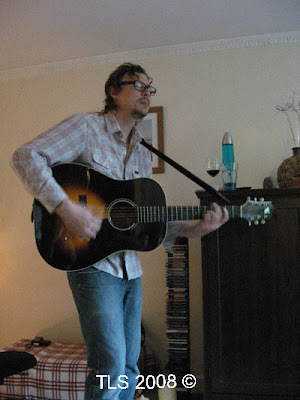 It was a nice change from the usual emotional hole you can be left with after a great gig - having connected with the music for an hour or so, then to have it torn away (and I’m sure this is why so many people get very drunk after going to good gigs). In a quieter moment, I took the opportunity to ask Jacob a few questions about when he began playing the guitar. He said he had started playing when he was twelve and had taken a few lessons but then taught himself. I also noted he is left handed but plays his guitar right handed, he explained that it was easier to get a right handed guitar. An unassuming man, he was very easy to chat with and before we knew it, the bbq was sparked up, more drinks flowed and a really enjoyable evening was being had by everyone. Inevitably as with all good things, the evening came to an end. They should know that they left behind them a new group of friends who were honestly blown away by what they had just experienced, I’m still getting calls and emails saying just that. Jacob will be playing to a sold out crowd at The Troubadour Club in Earls Court tomorrow (June 3rd). He then returns to the East Coast of America continuing his tour. If he’s looking for living rooms near you, please don’t let the opportunity to catch such a gifted artist pass you by. Sounds like a cool gig!